Mumford & Sons (from left: Ben Lovett, Marcus Mumford, Ted Dwane and Winston Marshall) accept the award for album of the year at the Grammy Awards on Sunday night. Listen to Mandalit del Barco's radio report from the Grammys at the audio link. The folk-rock quartet Mumford & Sons won album of the year for Babel and The Black Keys dominated the rock category at the 55th Grammy Awards on Sunday night. In a ceremony that ricocheted between appreciations for iconic musicians and performances by celebrated but not-yet-proven acts, the winners reflected both the diversity of pop music in 2012 and the lack of consensus about the music that defined the year. Rock bands dominated the big awards — not all of them inspired by early 20th century blues or folk traditions. Gotye and fun., two groups that would sound at home on best-of-the-'80s compilations, each won multiple awards. Unlike last year, when Adele's six wins, including the trophies for album, song and record of the year, felt like a foregone conclusion, this year's Grammy presentation had no obvious storyline. Before Sunday night, a number of scenarios were conceivable: Would fun. be the first act in 34 years to win all four major categories (record, song, album of the year and best new artist)? Would the three enormous singles of the summer (fun. 's "We Are Young," Carly Rae Jepsen's "Call Me Maybe" and Gotye's "Somebody That I Used to Know") divvy up the major categories? Would they split the vote and give The Black Keys an opening to dominate the night? Would the night be a coronation for critical favorite Frank Ocean? The Black Keys and Frank Ocean were shut out of the major categories, but each performed and picked up multiple awards elsewhere. The Keys won best rock performance, best rock song and best rock album, and Dan Auerbach, the group's guitarist and singer, also won producer of the year, nonclassical division. Ocean may have had the most to gain from the awards. An intensely private musician who won over critics with his sweeping, sometimes distant album Channel Orange, he was up for album and record of the year, as well as best new artist. He won none of them but picked up an award for best urban contemporary album as well as best rap/sung collaboration for "No Church in the Wild" by Jay-Z & Kanye West. Ocean also performed a slightly shaky rendition of his song "Forrest Gump" late in the broadcast, wearing a yellow suit and standing behind a piano on which a video of the bottom half of his body running down a road played. It was jarring, partly because it felt so much less rehearsed than the rest of the show, but also because it was one of the few times in the evening when a single person stood on the stage and performed. There were far more performances than awards handed out, and the stage often felt like a pop merry-go-round, where one performance bled into another. Taylor Swift opened the show with a carnival-inspired performance of "We Are Never Ever Getting Back Together" that never really came together. Collaborations ruled most of the night: Elton John was paired with young folk-pop singer Ed Sheeran, Miranda Lambert with fellow country nominee Dierks Bentley, R&B singer Miguel with rapper Wiz Khalifa, Maroon 5 with fellow radio star Alicia Keys, The Black Keys with Dr. John and the Preservation Hall Jazz Band. Rock bands were mostly allowed to take the stage on their own — Jack White, fun. and Mumford & Sons each got solo time in the spotlight. Tributes were an opportunity to pack even more performers onstage. Bruno Mars, Sting, Rihanna and Ziggy Marley toasted Bob Marley's memory by playing songs of their own that showed reggae's influence. Chick Corea, Stanley Clarke and Kenny Garrett played "Take Five" in honor of Dave Brubeck. Elton John, Zac Brown, Brittany Howard of Alabama Shakes, Mavis Staples and Marcus Mumford took turns on The Band's "The Weight," in honor of Levon Helm, who died last year. 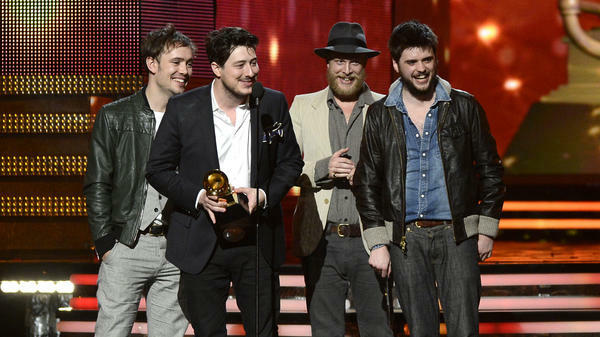 By the end of the night, Mumford & Sons' win for album of the year felt like a surprise. The group had lost four earlier awards, mostly in the rock and Americana categories. But if we were looking for narratives, the Mumfords should have been at the top of the list. Two years ago, the group played on the Grammys alongside The Avett Brothers in support of Bob Dylan, and the performance boosted the group's debut, Sigh No More, to the No. 2 spot on the Billboard 200 album chart. Babel, released last fall just in time to qualify for this year's awards (albums and songs had to have been released between Oct. 1, 2011, and Sept. 30, 2012, to be eligible this year), was the best-selling rock album of 2012. In the genre categories, there were a few clear favorites. Kanye West and Jay-Z won three of the four rap awards, for songs from their 2011 collaboration Watch the Throne. Skrillex won all three of the awards for electronic and dance music. Chick Corea and Esperanza Spalding each won multiple awards in the jazz categories. Only in the R&B category did the diversity of a genre's sounds — in songs and albums that look backward and forward, often simultaneously — come through. Winners included Usher's restrained falsetto on "Climax" (best R&B performance); Beyonce's endlessly climbing vocals on "Love On Top" (best traditional R&B performance); Ocean's dense, introspective Channel Orange (best urban contemporary album); the slick, sticky harmonies of "Adorn" by Miguel (best R&B song); and the jazz instrumentation and late-'90s conscious rap vibe of the Robert Glasper Experiment's Black Radio (best R&B album). There was also a dose of swinging, lounge-worthy soul from the night's biggest winner who wasn't up for any awards: Justin Timberlake sang two songs from his forthcoming album, The 20/20 Experience. Timberlake is a born performer, and the assembled stars seemed to let out a sigh of relief at his presence — finally, someone everyone could agree on was onstage. Timberlake just announced his return to music, but the Grammys wasted no time in embracing him — he appeared later, alongside National Academy of Recording Arts & Sciences president Neil Portnow and Ryan Seacrest, to help introduce the In Memoriam segment of the show. But the music industry isn't alone in backing Timberlake: One of those new songs, "Suit & Tie," appeared in several commercials during the rest of the broadcast. A singer who can get the crowd on its feet and win the endorsement of corporate America? Look out for him next year. The Grammy Awards were handed out last night. And while this year, no one swept the awards, rock bands had a lot to smile about. Mumford and Sons won album of the year and the band fun. took home song of the year and best new artist. NPR's Mandalit del Barco was backstage. MANDALIT DEL BARCO, BYLINE: American garage rockers The Black Keys picked up three Grammys, and the band's Dan Auerbach got another one for Producer of the Year, Non-Classical, making the musicians the biggest winners of the night. Electronic musician Skrillex got three Grammys. So did hip-hop artists Kanye West and Jay-Z, including one they shared with Frank Ocean. But Ocean lost out for Best New Artist to the New York group fun..
NATE RUESS: I don't know what I was thinking, writing the chorus for this song. If this is in HD, everybody can see our faces, and we are not very young. DEL BARCO: Ruess pointed out that the band's been on the road for 12 years. And backstage, he said the musicians had a lot of fun getting drenched while performing during the show. Then he made the kind of self-deprecating remarks for which the band is known. RUESS: The truth of it is, seriously we're sad and pathetic and we're going to end up in each other's rooms at the end of the night just being like pinching each other, being like, can you frigging believe what just happened? DEL BARCO: The Grammy Awards telecast opened with Taylor Swift singing in a scene that could have come from "Alice in Wonderland." Electronic musician Al Walser showed up in an astronaut costume. The CBS network had actually emailed artists a dress code, warning against anything political or too revealing. But presenter Jennifer Lopez still showed up in a black gown with a thigh-high slit. JENNIFER LOPEZ: As you can see, I read the memo. DEL BARCO: Co-presenter Pitbull pointed out it was actually toned down from a racy outfit she wore in 2000. PITBULL: You inspired the memo. DEL BARCO: Belgian-Australian rocker Wouter De Backer, also known as Gotye, was a little more low-key. Earlier in the day, he pointed out that his Record of the Year collaboration with New Zealand singer Kimbra Lee Johnson had humble beginnings. GOTYE: I recorded mostly in a barn on my dad's block of land southeast of Melbourne, Australia. So, I've got to thank Dad and my mum. It took about six months, me trying to find the right vocalist to finish this song. So, it was incredible to set up a microphone in Kimbra's bedroom and hear her start to sing some of the words. KIMBRA LEE JOHNSON: In the bedroom, yup. GOTYE: I knew right away she was going to turn it into something incredible. DEL BARCO: Gotye was just as humble picking up his award on stage during the telecast. GOTYE: I just have to say there are so many incredible songs in this category, not only in the Grammys more generally, but also so many artists and pieces of music that aren't recognized by the Grammys this year - I just want to say thank you for everybody who puts great energy into the world making music. I feel unworthy to be up here receiving this, but thank you all musicians and people who listen to music. Cheers. DEL BARCO: Cheers. Mandalit del Barco, NPR News, Los Angeles. MONTAGNE: This is NPR News. Transcript provided by NPR, Copyright NPR.